As a walking place, the trail around the lake is only ¾ mile. That isn’t much exercise. 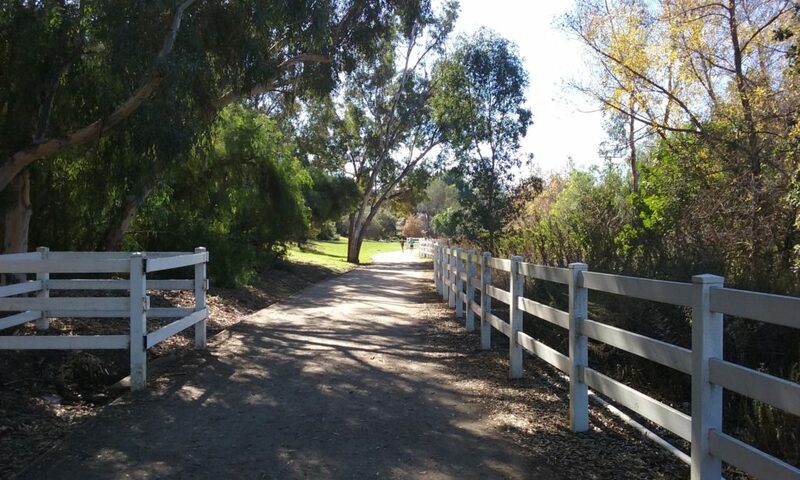 But picnic tables, bathrooms, benches, and the walk around the lake make it a wonderful starting or ending place for four different Fullerton trails that pass through or near the lake. (Hit the PageDown key four times to go directly to the description of those trails.) First, how easy it is to get to the lake: From Euclid, north of Rosecrans several blocks, just watch for the Laguna Lake sign. The picture above was taken on the dam. This dam has no gate and would be of the “weir” type (spills over the top, type) but only in a severe storm would it go into action. It is not a flood control dam because there’s no major flow into the lake. The level is not maintained by water going under it. Unfortunately it is maintained by how much city water goes in; whether a lot or more than a lot. Its water bill makes it an expensive lake to maintain. 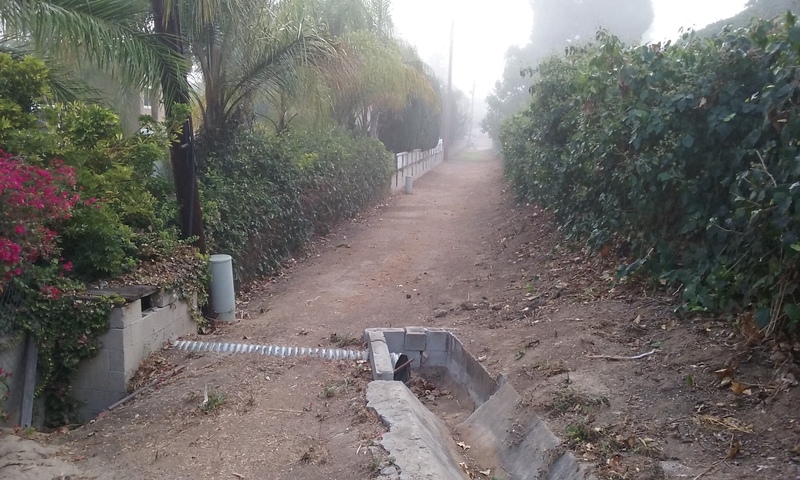 For more on dams in Fullerton click this: Dams and Spillways of Fullerton. The Fishing The word Laguna is “lake” in Spanish, which makes “Laguna Lake” sound as silly as the Sierra Mountains. But it is not a silly lake. It is our biggest lake. It is bigger even than the lake in Craig Park. Laguna is a stocked lake; “planted” is the technical name for it. It is only trout and catfish which are regularly planted, and only those two can you take home. (Which fish, how many and so on, is made clear on the fishing license each fisherman is obligated to carry with them.) There’s plenty of large bass (some blue gill) in there but they are of the catch and release type. (Camera Fish) You have to have a fishing license (even for catch and release) which of course, goes to pay for the farming and later planting of the fish. For more on fishing licenses, click here. It is obvious to all who eat the fish they catch, you don’t fish to save money. It’s a hobby and for some, an obsession. _____When Fish and Game come to stock the lake, it is only a few days after that, that most of the trout are eaten by the bass. (Trout is to some extent food for the bass which explains why you have to pay to fish. This even though you toss the bass back in.) So fisherman who want to eat the fish they catch, have to come shortly after the planting. On the day of planting word gets out and there’s a crowd along the shore. Everybody feels like they are the same team rather than competitors because it is well know among them that they are more in competition with the bass than each other. To know when that day is to catch trout, see this web site: https://nrm.dfg.ca.gov/FishPlants/SearchCriteria.aspx (We are a “South Coast” county, and the Water Name: Laguna Lake.) Notice that they approximate the date so you won’t rely on that website to go fishing. 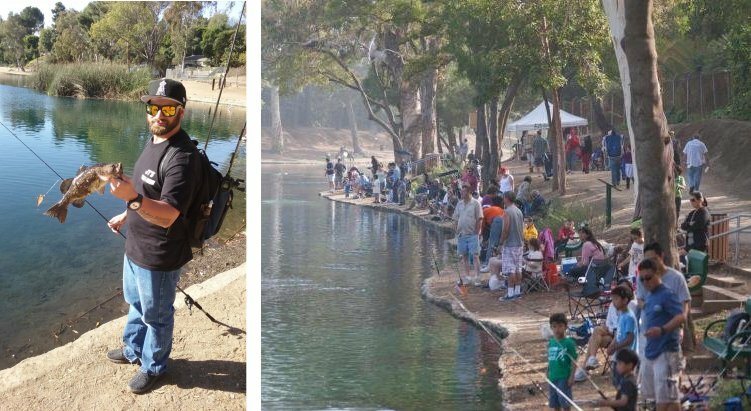 Once a year (first Saturday in April) the day after “planting” Fullerton Parks and Recreation sponsor a fishing derby. Adults of course have to have a license but kids (under 16) not only can fish without a license, they get to borrow all the fishing equipment they need on that particular Saturday. The Part of the Park That is Not Water . . .
On the map, that which is named Laguna Lake Park doesn’t actually include the lake. It’s not clear why the map stops 250 feet west of the lake. (The Parks Department does maintain the lake.) It is worth noting though that the dry part of the park is larger than the lake. The trees along the side of Euclid block the view of this underappreciated park. Most of this park seems undeveloped because there’s no grass. But it is carefully manicured to be free of brush which would grow up between trees which are irrigated. There are numerous trails bikers have warn into it. And because this is one of the principle parks even the bike trails are maintained for safety. And of course there’s the horse arenas that is the most noticeable part of the park. At the furthest south end of the park there’s a very impressive sign “Laguna Lake Park” on Laguna Road just 50 feet from Euclid. But it can’t be seen because of the overgrowth. That’s OK with the neighbors though because if people thought that was the entrance, there’s only their street to park on. The proper entrance to the park is further north on Lakeview Drive. Parking there is plentiful. South of the horse arenas; for those with metal detectors this area might turn up some treasures. See the History paragraph below. 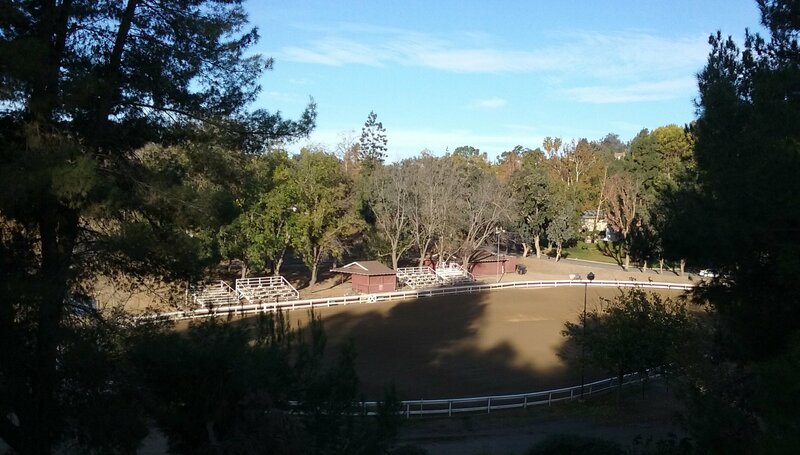 The larger of two arenas used by Fullerton Recreational Riders. 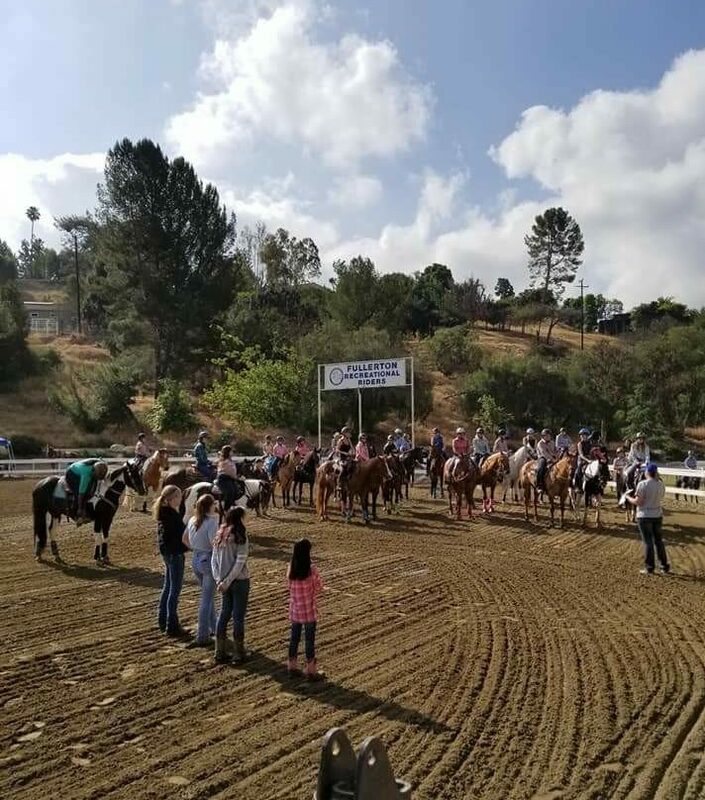 Fullerton Recreational Riders occupy the Laguna Lake Park Equestrian Center. This is perhaps the only club that has facilities owned and maintained by the Fullerton tax payer. Continuing cost is only weed abatement though; a small price to pay for what that club has done for the community. They are the ones that established the trails and maintained them for many years; some 28 miles throughout a city that is only about 5 miles across. The number of horse properties have dwindled since the 50s, but the club draws members from a larger area of the county. From this Equestrian Center and two stables horses still go on all of the 28 miles. 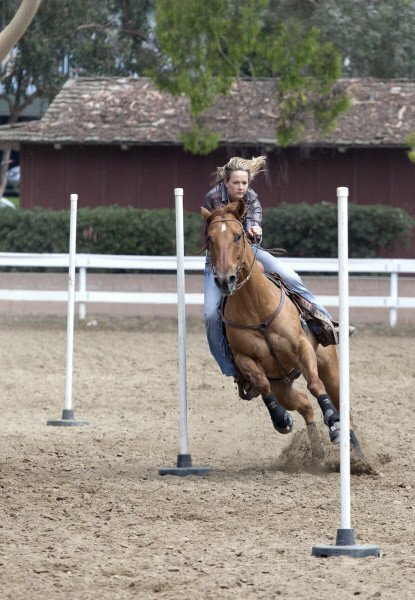 (There’s V & H Stables near Euclid and Bastanchury and Coyote Hills Ranch near Fullerton Sports Complex. And there are still many homes that have direct access to the trails.) Next to the arenas there are bleachers to watch the events. The big events are the Gymkhanas that are throughout the summer on the second Saturdays. This racing starts at 9:00 AM and goes till about 2:30. Fantastic breakfast burritos and hamburgers cooked to your order. 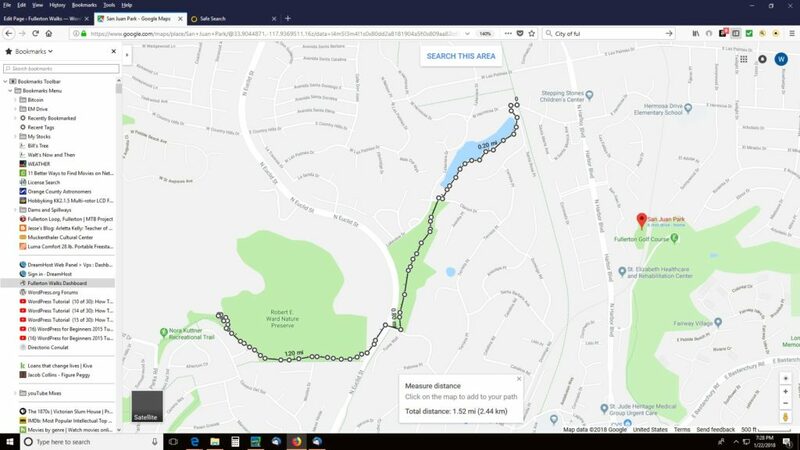 Plan your walk if you can to end there on a second Saturday and it will really make you day. 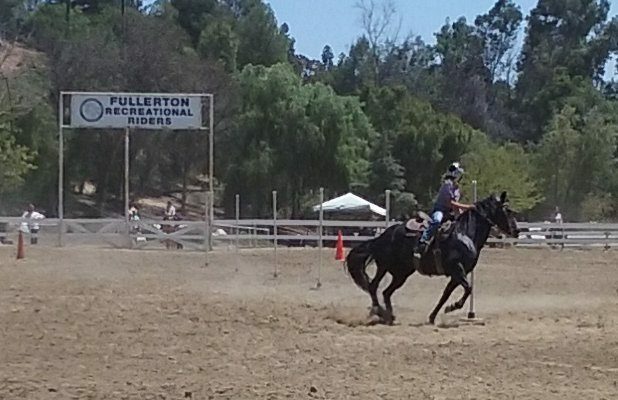 Click here for more on Fullerton Recreational Riders. 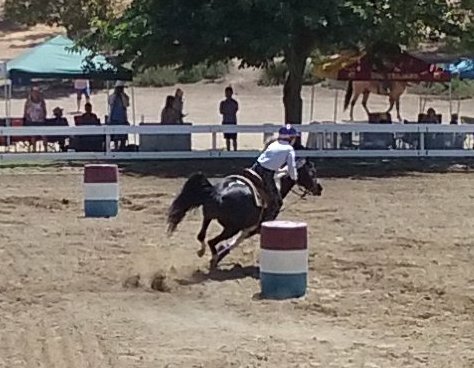 And see below for more pictures of their gymkhana. Between the lake and Laguna Road, in the late 1920s and early 1930s the Bastanchury Ranch (orange groves mostly) established a Ranch School for the kids of the Mexican workers. The lake was much smaller, merely a watering hole for the horses. To the south of the lake was an encampment of migrant workers who spoke no English. About 500 of them showed up on the census roles before 1930. This number and perhaps many more who escaped the census count, disappeared during the New Deal. It was April of 1933. Thousands of Mexican-Americans (legally here) were illegally deported back to Mexico. All the kids born here and some adults who were American citizens voluntarily left so as not to be separated from their families. This tragedy was supposedly to make room for white people who needed jobs, and were desperate enough to work the fields. It is not clear how many were willing to do the hard work and for how long. The history of farm laborers forced to leave usually left the farmers desperate for workers which meant higher labor costs and fewer crops picked. This higher cost couldn’t be passed on to their customers because oranges were in competition with fruit unaffected by forced labor removal. It was at this time the Bastanchury family lost their ranch to a group of bond holders. For more on this not-very-pleasant story of this area’s past, click on Herman Hiltscher on Citrus Labor. For a personal view from a Fullerton resident who lived through those times: Manuel Rivas Maturino. And here’s a link to a rather long article on Bastanchury Ranch and its migrant workers. 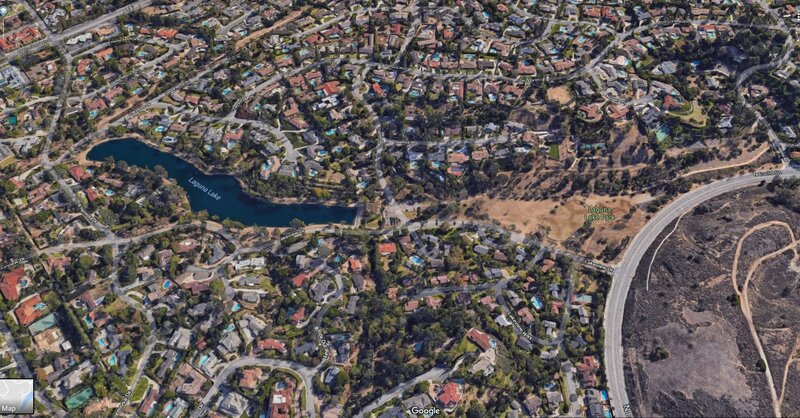 When this area was the center of the Bastanchury Ranch, the lake was just a low place that gathered water which the Bastanchury Ranch took their service animals to. The ranch had many windmills with pretty easy access to the water table in those days. The water was needed for the Bastanchury orchards which in the 1920s was the biggest in the world. (It was called a ranch because before oranges, lemons and walnuts, the Bastanchury family raised sheep. Bastanchury brought their Basque culture with them.) It was probably wind mills that supplemented the rain water that filled this lake back then. It really isn’t a natural area for a lake in that there’s no creek feeding it. In fact, just a few years ago, there was quite a controversy about water leaking out through the bottom of the lake at a tremendous rate; something like the equivalent of 200 families. This seemed to follow a dredging of the bottom in an attempt to make the lake smell better. Big mistake. Click here for more on the “Laguna Leak”. ____Bastanchury Water company was the last holdings of the Bastanchury family. And they eventually sold that off. It wasn’t that long ago that Bastanchury Water trucks were constant reminders of what was at one time synonymous with Fullerton. The final owners of the water company are gone too. Only the name remains to be bought and sold, as if the name was a product. 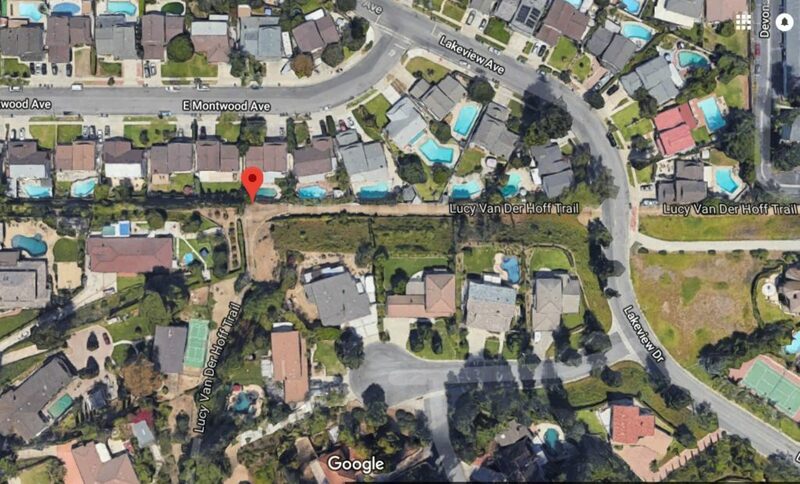 When the trucks were seen about town, the water came from a well next to one of Fullerton’s municipal wells on Pioneer, near Gilbert. But even the Fullerton pumps are abandoned. The only thing left is The Bastanchury House. It is comparable in size to the Muckenthaler mansion but in use by a family today. Looking south west at Euclid. Laguna Lake Park lower right and Nora Kuttner top left. Most of what is beyond Euclid in this picture is Robert Ward Preserve. Extending the Loop around the lake with an Out-and-Back to the “Top of the World” Both ends of the lake have access to other trails if you want to extend the walk in the form of an out-and-back. 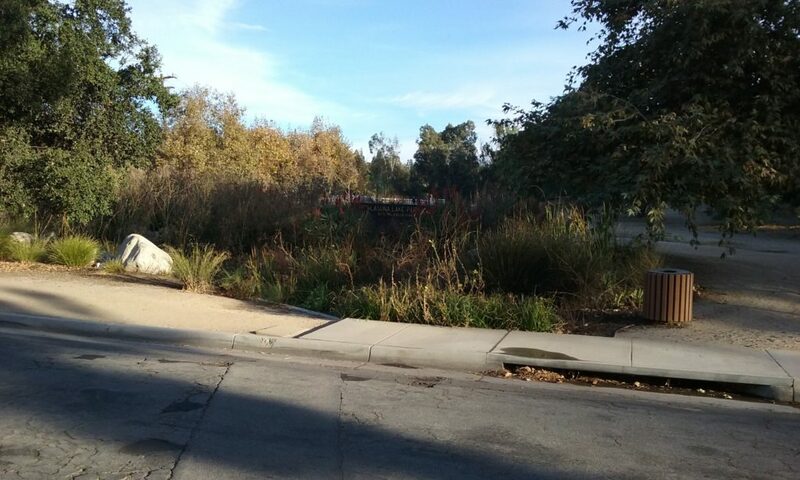 To extend your walk south and west of the lake, find your way to the Euclid crosswalk… not the one where the horse arenas are, instead walk south another quarter mile through Laguna Lake Park. Walk across Euclid there, not where the bicyclists dash across a block further down. Here’s a bit of trivia on crossing Euclid: Bicyclists dart across in a manner that seems dangerous. But it isn’t. They first go with traffic. They stay on that side until the opposing traffic is empty. You can’t do this trick walking. Even running doesn’t give you enough time because the street is so wide. So cross at the light at Lakeview Drive. Then walk south on the sidewalk to the entrance of the Nora Kuttner Trail. (That trail is detailed here: The Nora Kuttner Trail.) A good goal on the Nora Kuttner is ½ mile beyond Euclid at the highest point, where with a bit of exploration you can find places with incredible views looking east and south. This out-and-back to the “Top of the World” adds a mile to the 3/4 mile around the lake. A good goal going south from the lake is the bridge over the abandoned Union Pacific line. 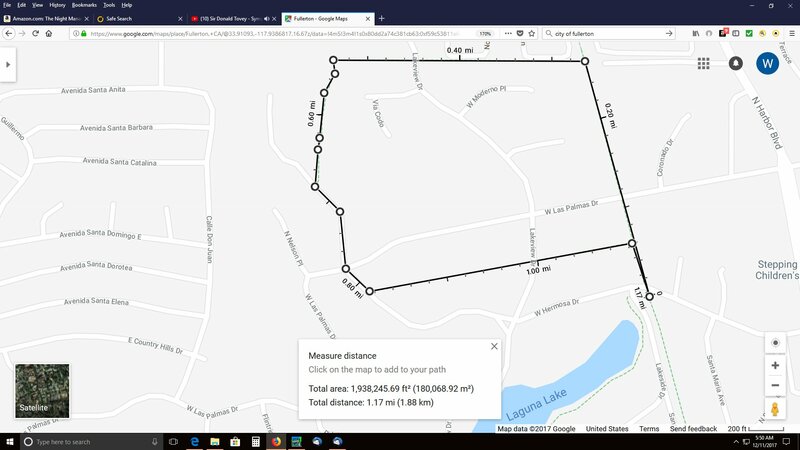 Two Out-and-Back Walks North of the Lake (adds ¾ mile and ½ mile) If you parked at the Euclid end and walked half way around the lake, you will be quite near the Juanita Cooke Trail. You can continue your walk by walking through the opening in the fence, across the street to the shady Cooke’s Corner. Cooke’s corner is an alternate place to park and can also serve as a meeting place because of the pretty good parking and a park bench. From Harbor (north of Bastanchury) take Hermosa left for two or three blocks. The Juanita Cooke Trail goes through Cooke’s Corner and of course you can take it either north or south. The Juanita Cooke Trail was a railroad track put in, in 1917-1918 and when the city built up around it, streets dead-ended there. So you walk is uninterrupted in either direction for miles. Go as far as you want, of course. To give yourself a goal going south, ¾ mile on is a bridge where the Juanita Cooke passes over another abandoned rail line. To give yourself a goal going the other way, there is the very end of the Juanita Cooke at the Walmart on Imperial; ½ mile. This was taken from the Lucy Van Der Hoff Trail looking at the Juanita Cooke Trail. 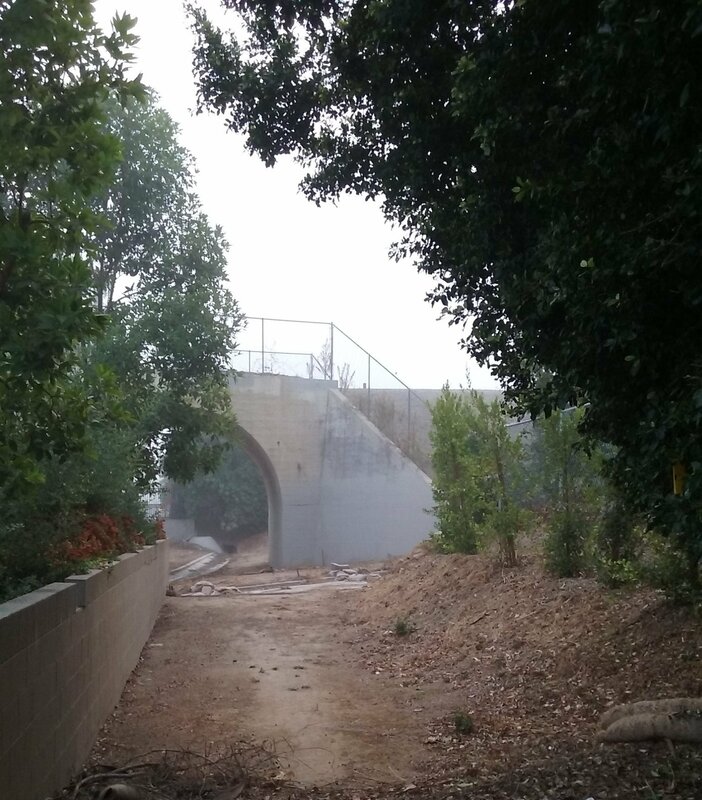 From 1927 to 1938 this was a road and the viaduct supported the Pacific Electric. 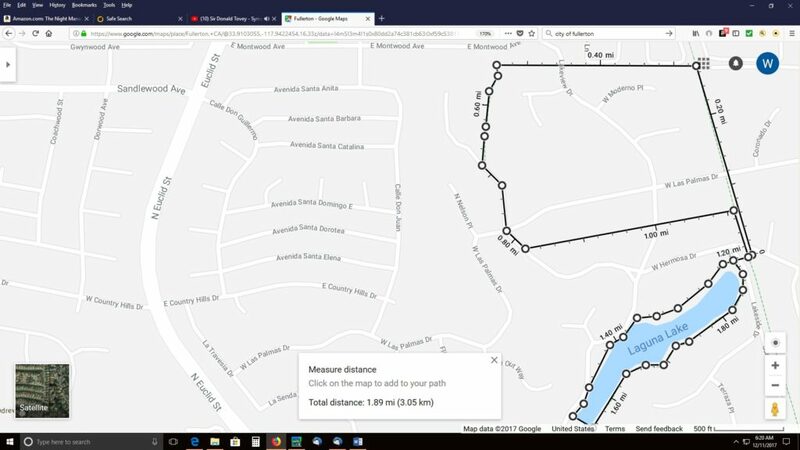 The Lucy Van Der Hoff Loop (1.2 miles) You get at this loop from the Juanita Cooke Trail stating at the shady grove called Cooke’s Corner going north. Cooke’s Corner is where you are when go straight out the opening in the fence at the north-east end of the lake. 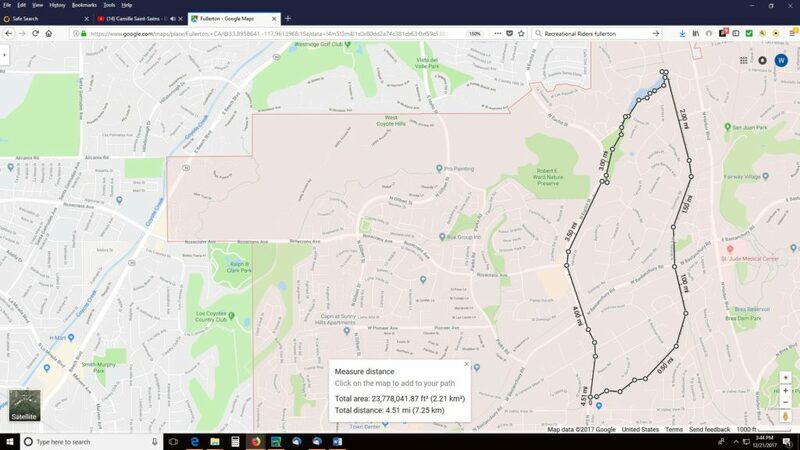 Note in the map with the name “double loop” that you will go .2 miles north on the Juanita Cooke and watch for a trail that goes off to the left. The Lucy Van Der Hoff Trail goes to the left, (west) but, you have go down and to the right to get at it. You will go underneath the Juanita Cooke soon after dropping down to the lower level. In going down to the lower level it becomes quite evident that the Juanita Cooke Trail you were just on is a transformed railroad track. 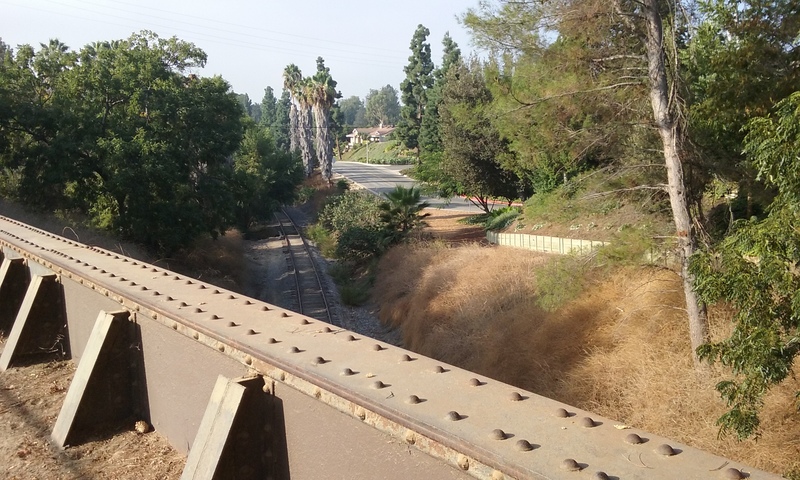 It is Fullerton’s first Rails to Trails project; the old Pacific Electric. It was an electric train with overhead lines to power the train; a trolley actually, an interurban rail coach. The Lucy Van Der Hoff trail that goes off to the left is dead straight for 1,400 feet (about a block and a half). It then turns left, uphill where it obliquely joins Hermosa Place which becomes Hermosa Drive in a few hundred feet. That road curves east at Cooke’s Corner. But instead, walk along that road (N Hermosa Place) until you pass La Palma then in about a hundred feet watch for another trail on your left. That trail is unnamed but will take you straight back to the Juanita Cooke. It emerges about ten feet above the Juanita Cooke Trail. The trail straight down the face may be too steep for most people, but you can find you way down the embankment by walking along the fence going south. From there you should be able to see Cooke’s Corner where you will pick up the return part of the loop around the lake. There is a very nice double loop which has the lake as one of the loops. The other loop is the Lucy Van Der Hoof Loop (described above) on the north end of the lake. You can start it of course at Euclid end or if Cooke’s Corner is where you parked you can first do one then the other. Click on a picture to see it fill the screen. From the Lake to the “Top of the World” of the Nora Kuttner Trail. The longest horse trail; 4 miles. On the right on the ledge is the exit of the “small loop.” In the back is Cooke’s Corner. Here you can see how straight the Lucy Van Der Hoff Trail is. It is the border line with La Habra. 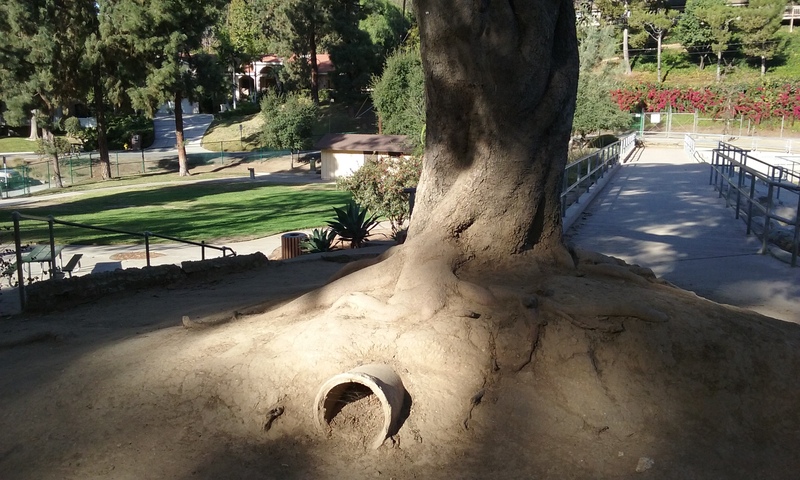 The 1952 formal entrance into Laguna Lake Park. The sign is still there as a kind of archeological relic. Here’s the mystery object for this park. Anyone know what’s going on here? This is the Lucy Van Der Hoff Trail. 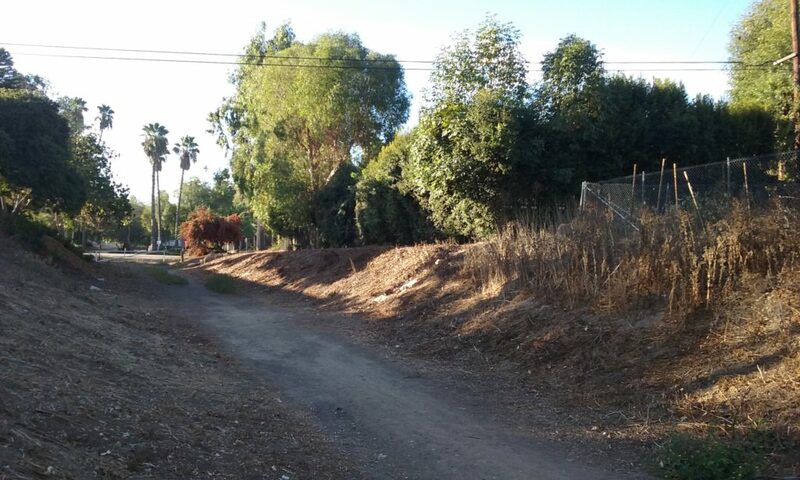 The trees on the left are in La Habra. Those on the right, Fullerton. There’s nothing the author of this website can come up with to suggest to improve the park or the trails that emerge from it. It and Hillcrest Park are the model for the rest.